A number of companies offer deep sea fishing charters. Most of the boats operate from nearby St Francis. There are a number of small nature reserves in the area, such as the Kabeljous Nature Reserve, which is a walk-about reserve with a safe beach for swimming and excellent fishing spots, as well as bird watching. The reserve includes a 4 kilometre hiking trail and its own flock of pink flamingoes (when in season). Nature lovers can also enjoy the Noorsekloof Nature Reserve, which runs through a popular residential area. Here you can look out for small buck and many birds while walking the 3 kilometre trail running alongside the stream, while breathing in the magnificent fragrances of indigenous fynbos. The Seekoei River Nature Reserve, situated on the Seekoei River estuary, is a bird watcher’s paradise with hides overlooking the river. For the energetic, Jeffreys Bay can also be explored from the seat of a rented mountain bike. There are some exciting places to visit of which the waterfall, located just outside of town, is perhaps one of the best. The natural pools are refreshing to say the least, while the waterslide and cliffs from which to jump off is perfect entertainment for the more adventurous. Most shops and businesses are along the main road (Da Gama Street) or concentrated around the small main town area. J-Bay is a good place to have a custom board shaped, as a number of surfboard manufacturers have made the town their home. 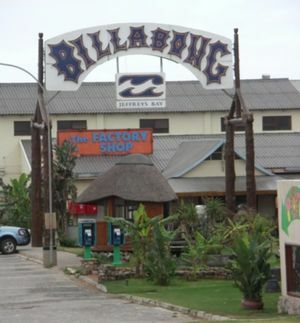 There are many shops selling surfer wear and this is the place to buy an exclusive Billabong or Quicksilver outfit. Apart from the retail stores, there are also surf brand factory stores where you can find great surf gear at bargain prices. This article or section does not match our manual of style or needs other editing. Please plunge forward, give it your attention and help it improve! Suggested fixes: Listings should be organized by price category (Budget/Mid-range/Splurge), not by cuisine type. The best budget breakfast has to be the Breakfast Pie. In Food', is the IN place and serves the best breakfast and coffee in town -just opposite Fruit&Veg. Restaurants are plentiful, Le Grotto and De Visvijf in town are well worth a visit. You can have almost all fast foods delivered by making use of special delivery services. The main swimming beach, Dolphin Beach, is an Alcohol Free Zone. There are many pubs and two nightclubs in town. Sadly Tritons no longer exists as a new holiday apartment development has replaced it. J-Bay caters for all kinds of accommodation. Backpacking hostels, caravan and camping, bed and breakfast, self catering and hotels can all be found. 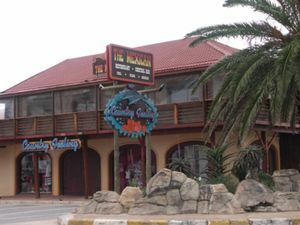 Jeffreys Bay Backpackers, 12 Jeffrey Street, ☎ +27 (0)42 293-1379 ([email protected], fax: +27 (0)42 296-1930), . R60 to R250 per night. edit The oldest and nicest Backpackers in town. Robberies of tourists and less careful locals are becoming more frequent. Be careful when walking alone on the beach, or while walking in town at night. Do not leave valuables visible in your car. Xenophobic attacks have happened in 2008, affecting local Somalians. Be careful when traveling along the road between Jeffreys Bay and Aston Bay at night, as pedestrians do cross without warning between the small informal settlements on both sides of this road. Also watch out for stray animals on the road. There are a number of internet cafes in town. Some offer wifi access and some are equipped for Skype calls. St Francis Bay is another popular surfing spot. Go to Port Elizabeth (75km to the east) and its attractions. The Tsitsikamma National Park is worth a visit to relax a day. See the Great Train Race during August or September where runners race The Apple Express stream trains from PE to Loerie. Visit Hankey and see the grave of Sarah Baartman just outside the town and the largest sundial in Africa (36.4m in diameter). Take a relaxing drive to Patensie and have breakfast at Tolbos.